Grizzly bear, Ursus arctos. 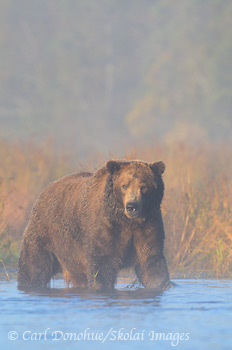 A large adult male grizzly bear stands in dawn's early light, shrouded in fog on a cool fall morning. Brown bear, Katmai National Park and Preserve, Alaska. Please click on the image above to view a larger version of this photo. I’ve shot this bear a number of years now, and it’s always exciting to see him on the river again. He’s a beautiful animal, and I’m lucky to have had so many great opportunities to see and photograph him. This entry was posted in Adventures, Alaska, Grizzly Bears, Katmai National Park, Photo Tours, Wildlife and tagged Brown bears, Grizzly Bears, Katmai National Park on November 1, 2011 by Carl D.
This picture is amazing! What an awesome bear! Ted is the coolest and pic too. Thanks. Indeed, Ted is awesome.